Believe it or not but in my family we have 4 out of 6 birthdays in April! Its a month full of presents, parties, and... CAKE! 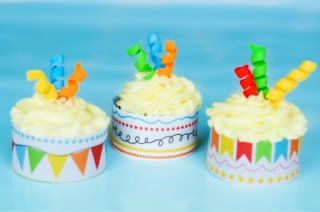 If you need to put together some quick birthday cupcakes then these are the perfect solution! I used the fondant streamers that I made from last week's tutorial. I cut some cute scrapbook paper in strips about 1 1/4 inches. You can customize these cupcakes for any party with any kind of paper and any color of streamers.